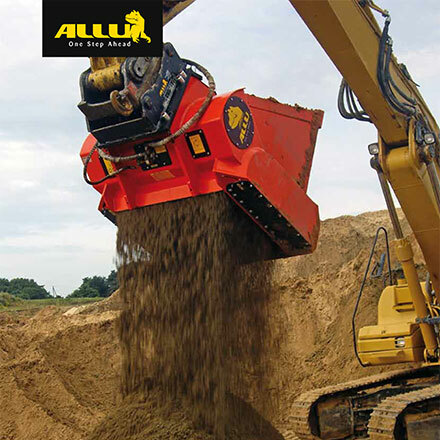 Hot on the successful launch of the ALLU Transformer products, RDW Excavator Parts (RDW) now has a national dealer network that shares the commitment to providing a value for money solution using high quality products. Equally important is the capability of the network to confidently stand behind everything we do. The ALLU Transformer is a unique product capable of giving our customers a sustainable competitive advantage and can provide terrific efficiency and operational improvements that will turbo charge their bottom lines. “Change or perish” – never in history has this saying been more true in business. The Allu Transformer is set to revolutionise everything from product recycling, through to on site material processing. So what is the big fuss? Don’t make the common mistake of confusing this for a crusher bucket. It is also very different to a screening bucket. In essence, it is an attachment with counter rotating shafts fitted with cams that break up the product. The easiest way to understand is to see it in action (click here). Like having to remove spoil from site (for instance bricks) and possibly transport replacement product back to site (like fill). Not only can it reduce your transport cost, but your waiting time for replacement materials as well. How many truck loads can you save if the product could be more compact reducing the air space in each load? Reduce steps that don’t add value, like simply moving the product around – process it in the same step if you can. Can you Re-use materials that are now a waste product? Alternate technologies struggle if the product has a certain amount of moisture – what if you can sieve wet soil/material? Would it expedite your project time frame? Phase 1 of the ALLU launch was to prove that the product worked to pave the way for a serious assault on the market. We now have stock on the ground, spare parts and consumables, as well as demonstration units available. Phase 2 is to utilise the technically competent dealer networks to mainstream the ALLU products in the Australia market. This is where preparation and opportunity now combine, and we look forward to achieving market wide success for our dealers and customers.